With the March 5 deadline rapidly approaching, Donald Trump continues to politicize immigration and blame Democrats for the lack of progress in Congress. Never mind that the problem only exists because Trump rescinded the Deferred Action for Childhood Arrivals (DACA) program that was implemented by President Obama in 2012. And Trump’s insistence on tying the restoration of DACA to other punitive measures and his idiotic border wall further set back any reasonable resolution. In this scenario Fox News predictably has come to the aid of the White House they are in collusion with on virtually everything. 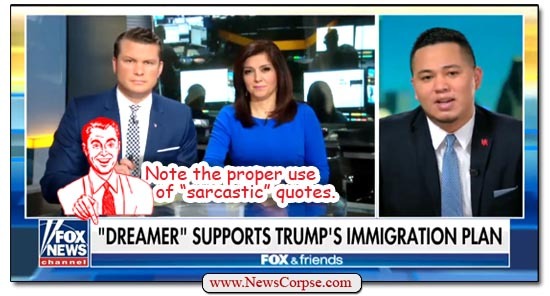 The “Curvy Couch” potatoes of Fox and Friends magically managed to find a conservative DACA recitpient to join them for a Trump-fluffing session on Saturday morning (video below). Hilario Yanez was introduced as a “DREAMer” and was immediately asked what he likes about Trump’s plan. He responded with praise for Trump’s alleged leadership, compassion, and courage. Presumably these are traits demonstrated by first rescinding DACA and then throwing up numerous obstacles to its restoration. It’s true that Democrats did absolutely nothing about DACA between 2008 and 2011. They might have done more except for the fact that it didn’t exist. The policy was established by Obama in June of 2012 by executive action after the Congress was stymied by persistent GOP opposition. As noted above, it was later rescinded by Trump in September of 2017. However, it’s absolutely untrue that Democrats “owned all three branches of the government” from 2008 to 2011. George W. Bush was president until January of 2009. And Democrats were short of filibuster-proof majorities during much of that time due to the months-long delayed election results in Minnesota (Al Franken’s race), and the death of Sen. Ted Kennedy. Also, Republicans assumed the majority in Congress in January of 2011. That’s a lot to get wrong and Fox didn’t bother (or know) to correct these easily identified falsehoods. There is so much wrong with that tweet it’s hard to know where to begin. First of all, Trump didn’t bother to attribute this comment to its source. That’s the definition of plagiarism. His language was nearly identical, complete with the factual inaccuracies. And the timing of the tweet further proves where he stole this from. Secondly, it’s ludicrous to assign any interest in DACA to Republicans who have been working tirelessly to quash it. And finally, Trump’s political cheerleading at the end does nothing to further a legislative solution. But it does imply that he isn’t interested in any solution until next year when a new congress is seated. Ironically, Trump’s total abandonment of the DREAMers is going to frustrate his hopes for a more republican Congress. The American people overwhelming favor DACA with a pathway to citizenship. And Latinos are presently the fastest growing segment of the electorate. All of this combines to bolster what many election analysts are predicting will be a “blue wave” in November. Let’s hope that comes to pass. But more importantly, let’s work our butts off to insure that it comes to pass. We may have the political winds at our backs, but Trump has a massive propaganda platform and, of course, Russia.